Discussion in 'Other Guitars' started by Biddlin, Apr 16, 2019 at 8:29 PM. I somehow managed to play for 40 years before I finally got hold of my first SG. I was moonstruck. The ease with which I floated through slick jazz and acid rock passages without even thinking about the physical attachment to my hands blew me away. I have a herd of them now. My first, I swapped in rewound pickups and gold hardware. Played as hot as it looked. A gospel preacher bought it from me a few years ago. Then I grabbed Miss Lizzie, a black 2005 deluxe, shown here next to my 08 Classic with Gibson branded lyre. About the same time a couple of 03 G-400 Vintage showed up. I put 57 classic pickups and a lyre on this one and kept it. I had been on the look out for a special with ebony fretboard, found these two 2003s within a week of each other. Five Moons is my go to rock guitar and the one always on the stand next to my easy chair. The cherry finish one is a real good player as well. The cherry Classic above came to me with a broken headstock requiring 20 cents worth of woodglue and 10 minutes of work to make it the lightest action and easiest player i n the pack. 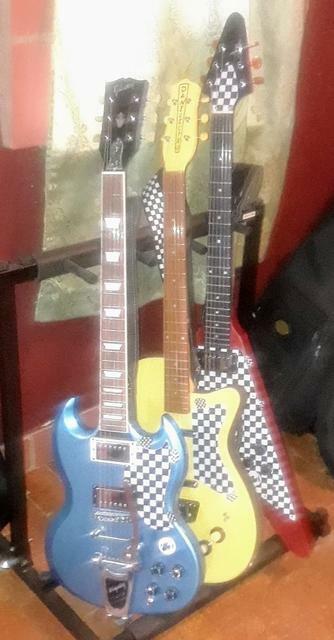 They are all real good axes for flashy stage work. The 2013 SGJ is 24 frets of rockin thunder. It is the lightest member in this flyweight class. I love and play 'em all, though Five Moons and the 03 Epi get slightly more play time. If you play Les Pauls, these are great to for taking a little weight off in the middle of a set. OK, I showed you mine, let's see yours! kenneth, Strang_Banger, Rat cam 68 and 16 others like this. I've never owned or even played an SG. Maybe it's time for me to give one a try. Strang_Banger, Robb, Toddcaster64 and 7 others like this. Keep looking for the right one. Never had one that stuck. Robb, Toddcaster64, mb doug and 4 others like this. They are my 'guitar.' Some people love LP, Strat, Tele...I'm an SG man. Robb, Toddcaster64, mb doug and 5 others like this. I have fallen deeply madly completely for their effortless playability! Those are some nice looking guitars! I too love my SG. But, I only have one. It’s my all time favorite guitar for multiple reasons. It’s a 1996 Standard. And then there is this. It’s either going to be great or a complete disaster! LOL!!! waynes world, Rat cam 68, Robb and 12 others like this. Robb, Nickadermis, Toddcaster64 and 3 others like this. I'm being ultra patient but I do want a G-400, ideally a Vintage worn brown one. Robb, Nickadermis, Toddcaster64 and 5 others like this. I've had three. I only have one now. It's a black '04 Epiphone SG Special i got new. It's a bolt on neck with a tune-O-matic bridge. It's got the 650R and 700T pickups in it. It was a gift, so it has sentimental value to me. My first electric guitar in 1979 was a Japanese SG copy. The other two i had were a '16 VB Glen Burton SG and an aged cherry '06 Epi G400. kenneth, Strang_Banger, Rat cam 68 and 10 others like this. Toddcaster64, mb doug and dbrian66 like this. SG's are cool guitars for sure enjoy! Robb, Toddcaster64, mb doug and 3 others like this. There’s a g-400 near me for way too cheap. I’m trying to hold out and save up for an es339, but the GAS is getting pretty bad for that SG. Biddlin, Toddcaster64, mb doug and 3 others like this. kenneth, Strang_Banger, Rat cam 68 and 9 others like this. If I had to chose one style of guitar, it would be hard to decide between SG’s or V’s. kenneth, Rat cam 68, Biddlin and 10 others like this. I've always been attracted to SG's because of Tony Iommi, I especially like his signature model. That's the first SG I actually ever saw, and not even in person. I was mainly a drummer at the time, but I'd always take flyers, catalogs, etc... from music stores (the free ones obviously) and one was an ad for his signature SG and I remember thinking how cool and "evil" it looked. When I was around 14, I was at band practice and one of our friends came over to jam with his Epiphone SG Special. It was the basic 2 humbucker version, in red. I remember that the action was amazing, and it sounded really good for being such a cheap guitar. In my late teens I remember trying out different SG's at Guitar Center. I remember playing the worn faded brown Gibson model. Two humbuckers, I think it was like... 899? Or somewhere less than a grand. It was really nice. I tried the higher end Epiphone SG's as well, and they were nice as well, but I still preferred the Gibson. I didn't get to try any of the higher end Gibson SGs as they were way up on the wall and I didn't want to bother anyone for assistance since I didn't plan on buying anything that day. If one day I come across a nice Epiphone or Gibson SG at a price I can afford (actually afford, instead of just an impulse buy), I will pick one up, but my loyalty remains to Stratocasters. Biddlin, Robb, Toddcaster64 and 4 others like this. I thought I was a die-hard 9.5" radius fan, but my G400 faded brown has made me realize how much I appreciate the 12" radius... it is just such a comfortable guitar to play... although sometimes the neck feels beefier perhaps when I'm tired, but the 22 frets, great sounding alnico humbuckers and all the hardware make for a sweet looking guitar that is extremely versatile for any genre of music. So far, it looks ubercool! Biddlin, Toddcaster64, mb doug and 1 other person like this. Ok, count me in. The Seventies! Platform shoes, bell bottoms, and the 1973 Gibson SG Special in walnut with mini-humbuckers, and harmonica style bridge. Great sounding guitar. kenneth, RoyalWe, Biddlin and 12 others like this. Yeah, I am going to have to fill the holes and then redrill for a Fender scale. That’s the part that scares me. Biddlin, Toddcaster64 and mb doug like this. Y'all got some sweet SG's! I've had a few over the years, but never really bonded with them. I got this 2014 SGJ a few months ago in a trade, and I do believe I have a keeper this time! stratman420, kenneth, Rat cam 68 and 6 others like this.